One game down for the San Antonio Spurs in the Western Conference Finals as Tony Parker went on to score 20 points & 9 assists against the Memphis Grizzlies in game 1 of the Western Conference Finals. Kawhi Leonard & Danny Green also had a combined 34 points to help the Spurs beat the Grizzlies, 105-83 in Game 1. 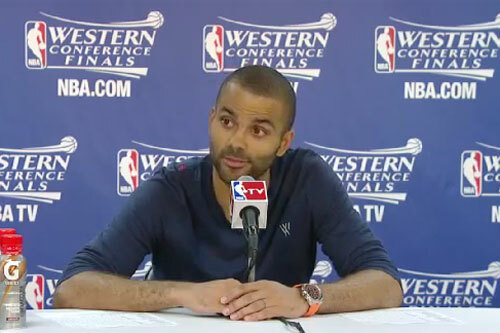 Photo shows San Antonio Sours point guard Tony Parker in an interview with the press after they defeated the Memphis Grizzlies in game 1 of the Western Conference finals on May 21, 2013. Parker had 12 points as the Spurs lead the Grizzlies, 51-37 at the half. He scored 20 points and dished out 9 assists as the Spurs ran away with the game 1 win over the Grizzlies. Parker, who is of french descent, became the starting point guard for the San Antonio Spurs in the 2001 NBA Draft and helped the Spurs win three NBA championships in 2003, 2005 & 2007. He has been named to five NBA All-Star games, an All-NBA Second Team, and an All-NBA Third Team. He was the 2007 NBA Finals MVP. If you would like to book basketball speakers or NBA stars like Tony Parker for a speaking engagement, autograph signing, guest appearance, product endorsement, golf tournament, marketing or PR campaign, charity fundraiser or special event, you can request Tony Parker speaker & Tony Parker agent details. For booking agent information on how to hire San Antonio Spurs players for appearances or call 1.855.503.5450.